‘Clyde the Glide’ is the name given to a mechanism that lowers the pitch of the second octave open C#. When the octave lever is pressed, Clyde closes the C pad the proper amount to allow the tone C# to play in tune. Because this mechanism is adjustable, it removes lost motion from the octave key. There are two screws on Clyde; one on the top and one on the side. 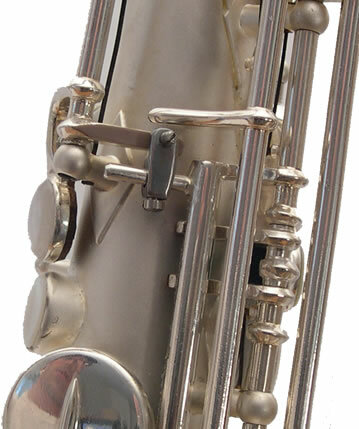 The screw on the top allows Clyde to glide back and forth between the fulcrums of the C pad and the octave lever touch. This changes the amount of movement in the small C pad. The second screw is tightened down to keep two parts in constant contact.